Believe it or not, even though it is an unexpected source, our brain is significantly affected by our gut. Apparently, a healthy gut equals a healthy mind. The gut is our second brain and the bacteria that thrive there mold our brain structure and possibly affect our mental health, mood, and behavior. “The human gut has 200 million neurons — the equivalent of a cat’s or dog’s brain. Your gut also houses nearly 100 trillion microorganisms, which influence everything from biological to emotional functioning. Your upper brain is home to your central nervous system while your gut houses the enteric nervous system. The two nervous systems, the central nervous system in your brain and the enteric nervous system in your gut, are in constant communication, connected as they are via the vagus nerve. This is also known as the gut-brain axis. Moreover, even 90% of all the fibers in the vagus carry information from the gut to the brain. The communication is enabled through molecules produced by gut bacteria, that enter the bloodstream. The blood releases hormones and neuroactive compounds that reach the brain through the bloodstream. This imbalance of beneficial versus harmful gut bacteria, called “dysbiosis,” causes a list of psychiatric and neurological disorders, including stress, autism, anxiety, and depression. Moreover, it can even contribute to the development of neurodegenerative diseases, like Alzheimer’s and Parkinson’s disease. This might be a result of the pro-inflammatory states elicited by bacteria imbalance on or inside the body. Additionally, researchers suspect that manipulating the gut bacteria can produce behaviors linked to anxiety and depression. A 2013 study showed that by replacing the gut bacteria of anxious mice with bacteria from fearless mice, mice became less anxious and more sociable. This also worked in reverse. 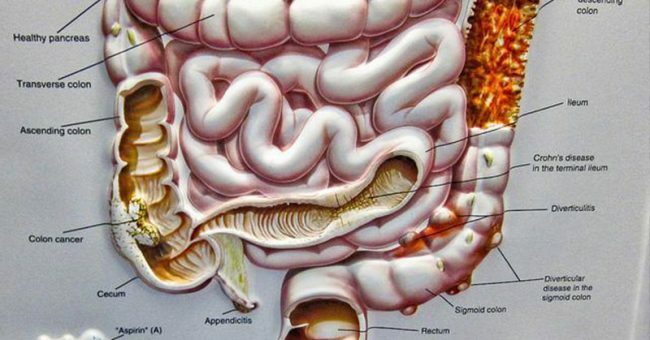 These findings are very important and promising, as the connection between the gut and brain can possibly be of help in the prevention and treatment of neurological and neuropsychiatric disorders. “Regularly eating traditionally fermented and cultured foods is the easiest, most effective and least expensive way to make a significant impact on your gut microbiome. Healthy choices include lassi (an Indian yogurt drink, traditionally enjoyed before dinner), fermented grass-fed organic milk such as kefir, natto (fermented soy) and various pickled fermentations of cabbage, turnips, eggplant, cucumbers, onions, squash, and carrots.